Compact is key in the urban environment. With RCE's new Passenger Rail Tie Crane modified specially for Third Rail Systems, operators can work in even the tightest of conditions in the metro area. With outstanding lift capacity, swing torque and a tight tail swing, these Tie Cranes will keep any project on track. 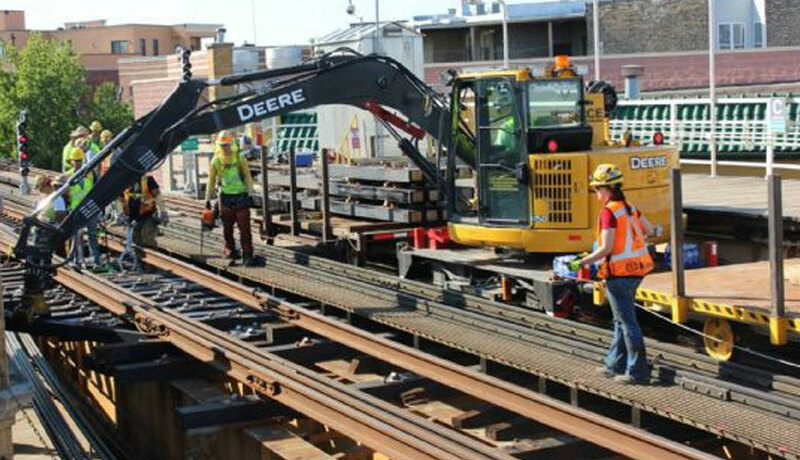 The lower structure of the Tie Crane features a reduced width lower frame to allow clearance for Third Rail applications. The dual high torque dive motors (one on each axle), increases drawbar pull. The hydraulic actuated brake on each axle provides increased reliability in all weather conditions. With its low center of gravity, the platform design offers greater stability on the track. With the John Deere excavator upper assembly, the machine boasts all the modern excavator features and readability. The Powerwise III Interim Tier 4 emissions compliant engine delivers more torque with impressive fuel efficiency, consuming up to 50% less per day than that of other competitive tie crane models. The heavy excavator boom was designed for greater reliability and versatility with two arm options. The swinging boom offers greater versatility for placing ties in tight conditions and the reduced tail swing provides the ability to work without fouling an adjacent track. 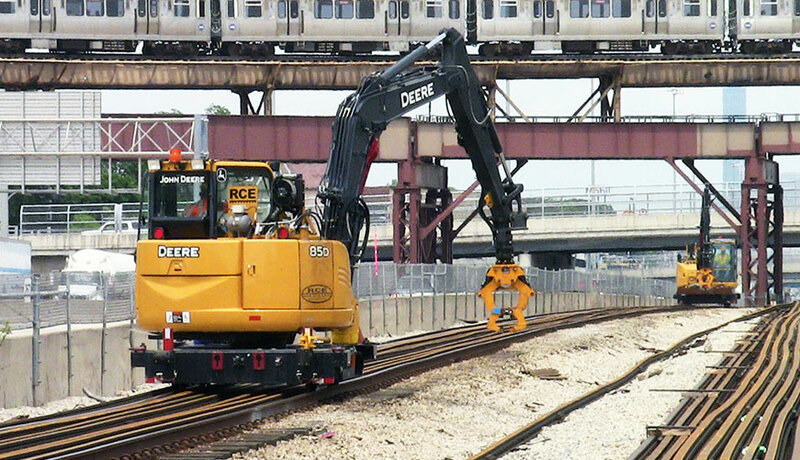 RCE Tie Cranes provide an innovative approach to railroad maintenance tasks, combined with the proven reliability and latest technology from Deere construction excavators. All the power, smoothness and ease of operation you expect from John Deere excavators in a compact, easy-tomaneuver package. Spacious cabs offer noticeably more glass, comfort and visibility. 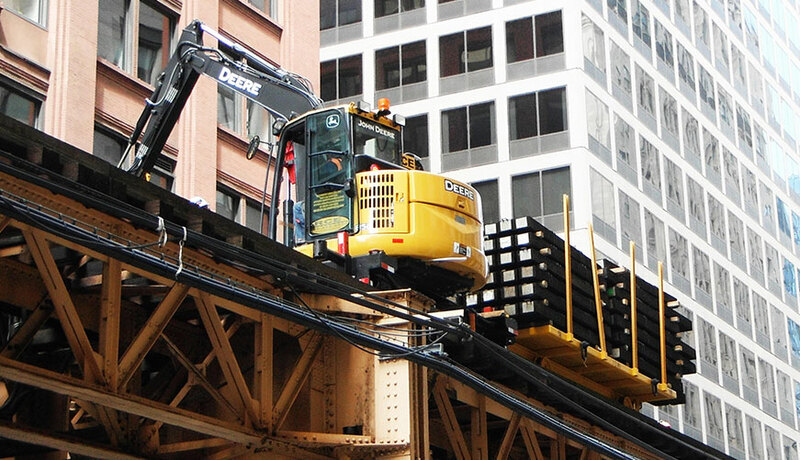 For any service needs, the Passenger Rail Tie Crane has been approved and backed by the John Deere dealer network throughout North America.